Whats new this Month? If you thought that the mini-lister built by Simon Andrews was neat then you'll love this model of a rollmodels speeder. If you like the model perhaps you shoud go out and buy the real thing. Just the thing for running in your garden. Find it in the models section. Thanks for dropping by. Whatever your interest level in model railways or even miniature railways we hope that you'll find something of interest here. When we at Gnine.info first started thinking about Gnine we were very excited. We aren't the first people to model miniature railways using garden railway scales. But we think that the idea of grouping them all together under a common term is. If you've no idea what Gnine is start off by going to "What is Gnine", then go to the F.A.Q. section "More questions" where we'll hopefully answer any more questions you might have and get you started in Gnine. Gnine news will let you know if and when kits become available for gnine and where you can see a gnine layout on show. The Gnine modelling Articles is where we will go into greater detail on certain aspects of Gnine modelling. We have some interesting articles planned. This shoud be a section to watch. 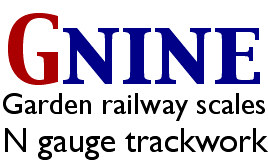 Gnine layouts will feature the layouts of the growing band of Gnine modellers. Gnine models will be where locomotive and rolling stock models will be featured. We hope that Gnine.info will build into an online reference for modelling in these scales and to that end we need your help. If you are a like minded modeller get in touch and share your experiences so that the beginners can learn. If you are a beginner get in touch and we can follow your progress and so inspire others to have a go. At the moment the locomotive models are of internal combustion industrial protoypes. So If you've modelled some steam outline miniature railway locomotives in G scale we'd love to hear from you and show the pictures here.